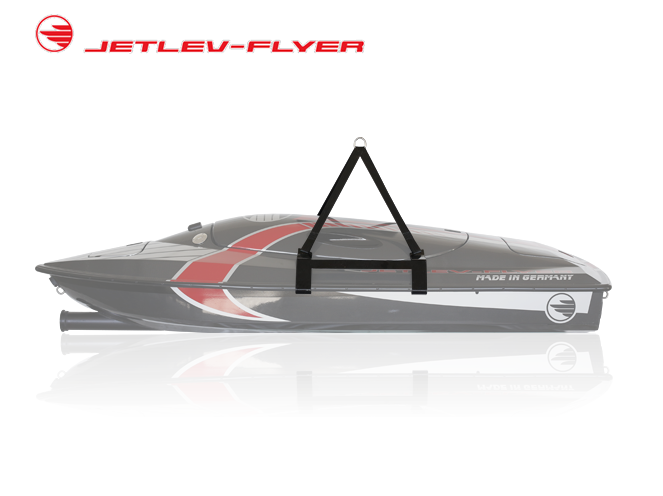 Unlike conventional aircrafts and jetpacks, the innovative JETLEV-FLYER concept greatly improves thrust-to-weight ratio by locating the propulsion engine, fuel system and related systems on a separate vessel tethered behind the jetpack, and uses water as the jet propulsion medium because its high density can carry vast amounts of power at much lower velocities, and generate nozzle reaction forces much more effectively than gases. Extensive research and test results helped us to develop many safety features and „best practice“ operating procedures. 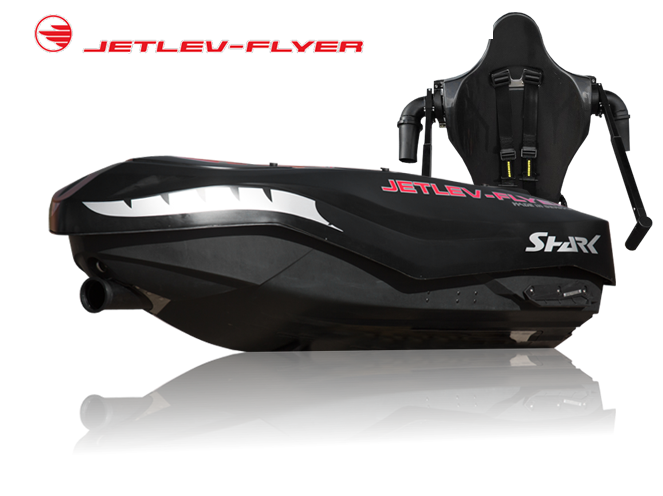 Although falling from height or at speed is inherently risky, from our experience falling from the JETLEV-FLYER is rare, and platform diving from 10 meters has been widely practiced for over a century with excellent safety records. Central to our safety design is using water as a safety net and enforcing low flight ceilings by restricting hose length. 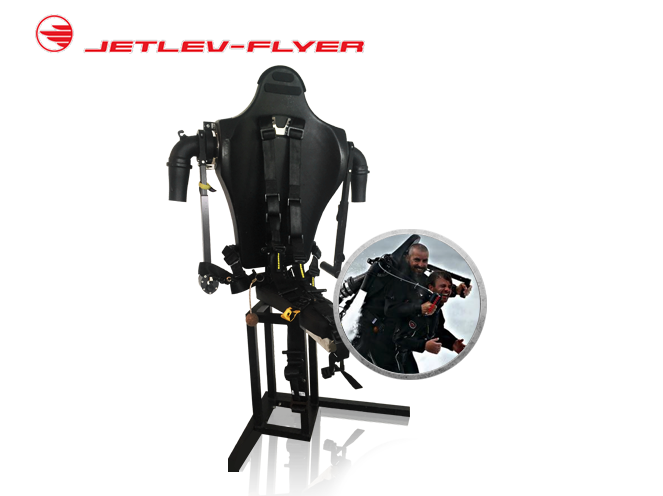 The jetpack’s 5-point quick-release harness, protective backrest and head support, safety saddle and inherent floatation are just some of the many other safety features..
A flexible water supply hose delivers power to the jetpack with pressurized water. 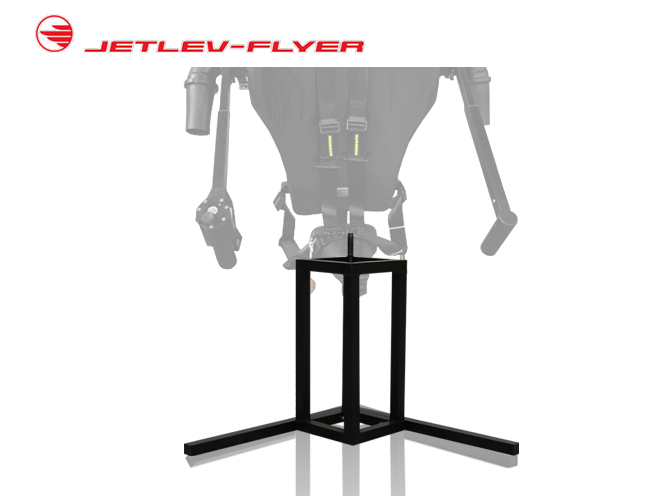 and maintains forward heading stability of the jetpack in flight. Traditional designs of airplanes suffer from low thrust-to-weight ratios which limit their performance and agility. Even F/A-18 E/F fighter jets can barely overcome the force of gravity. To achieve a dramatic improvement in this ratio, we decided to locate the propulsion source on a separate boat-like unit and transmit low pressure, high flow water to the jetpack through a supply hose and generate thrusts by nozzle reaction force. 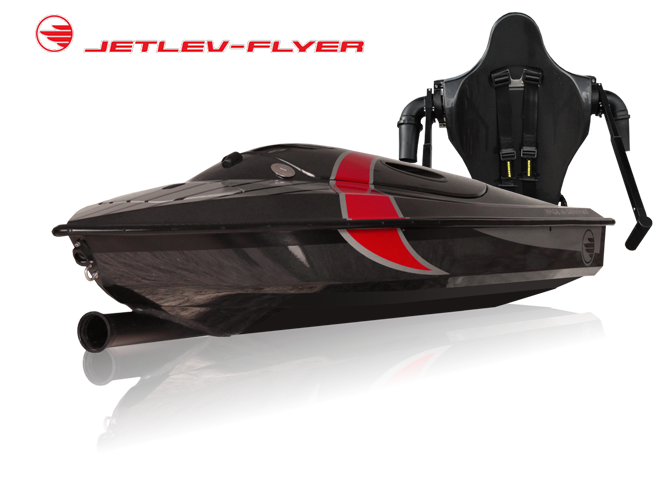 Fly-by-wire digital throttle control; nozzles angles determine allocation of thrust between lift and propulsion (forward, neutral or reverse); differential nozzle deflection generates yaw moments; and weight shifting from side-to-side generates roll moments.Our JETLEV-FLYER models are very simple to learn and operate. Intuitive flight controls, inherent stability and an effective training system mean that most student pilots can learn to fly solo within a few minutes of in-water instructions. 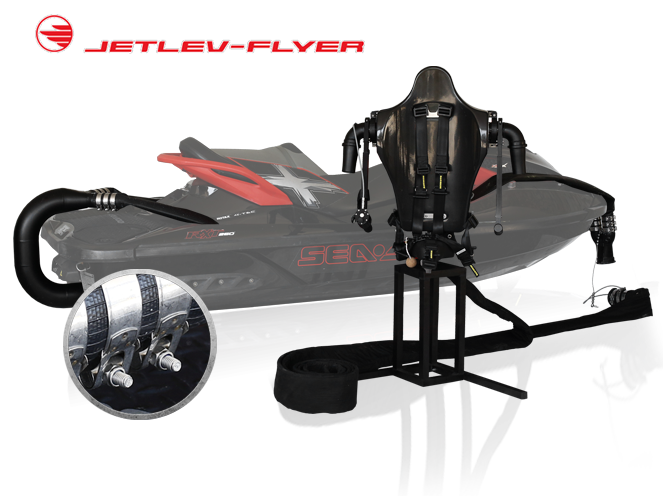 The most affordable way to fly your own water jet pack. 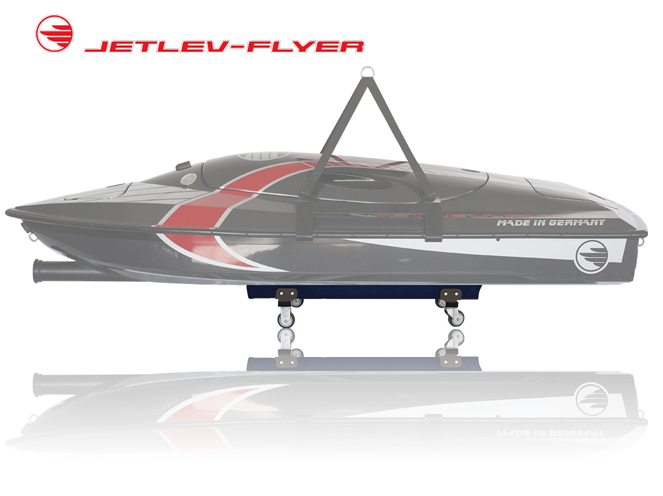 It is the perfect product even for smaller yachts as it can be stored in most rear garages or on lowerable swim platforms. 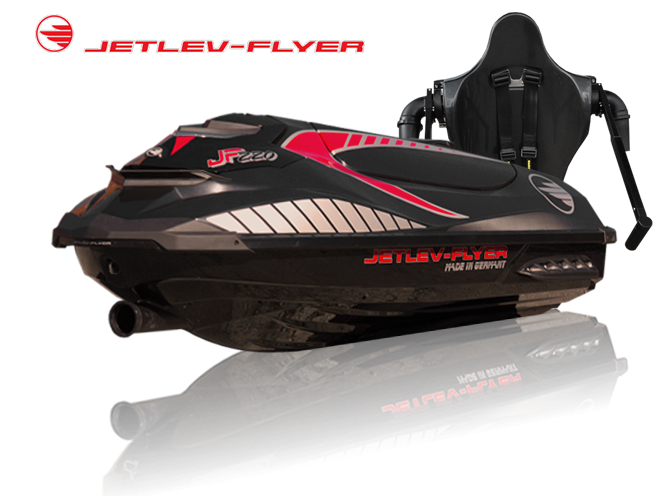 This innovative musclecraft, equipped with a supercharged engine, is your easiest access to flying thrills. This special seat allows the pilot to take a passenger with him. Perfect for family, rental and training issues. Enjoy flight thrills together! The remote control box is ideal for training issues. It’s in use directly from trainer over the jet ski.! For proper jetpack storage and for comfortable buckle on procedure it’s made out of complete hard-coat-anodized aluminum tubes. To lift the device up and down by using your davids. 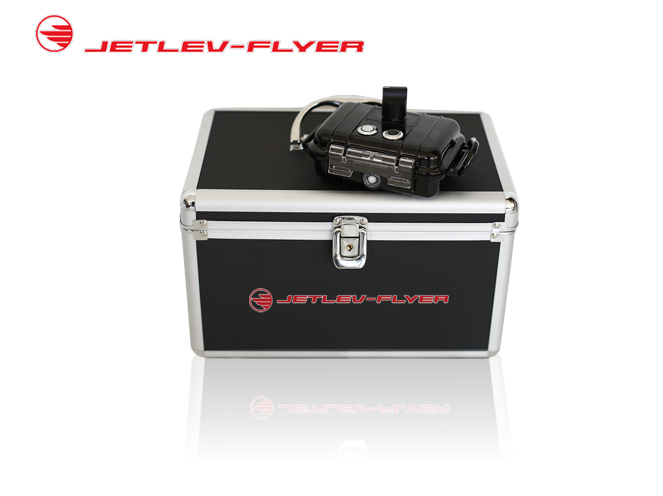 This tool is highly recommended to lift your jetlev flyer in total security..
To move the device everywhere in total security. The Boat unit yacht stand is made out of aluminum, powder-coated and is equipped with rubber wheels.